2016: HOW DOES IT COMPARE TO OTHER BORDEAUX VINTAGES? 2016 is being heralded as yet another Bordeaux vintage collectors should not miss. It would not be off the mark to think that successful years have become the norm in a region which, in times past, produced many entirely forgettable vintages. In this century, the string of impressive years started with 2000 and has included 2005, 2009, 2010 and 2015. We could go further and say that the quality of all vintages is higher owing to both consistently benign climatic conditions and viti-vinicultural advances. To name two, strict sorting of grapes and severe selection of lots for an estate’s grand vin – once altogether rare – are now common practice, and not just in the uppermost ranks of Bordeaux châteaux. There have always been exceptional vintages, at the rate of two or three per decade, but there were as many disappointments. Even the weakest recent outcomes are nevertheless superior to the lowest points of the past. While our attention is understandably focused on the outstanding years, the lifting of all boats represents a fundamental transformation in the long history of Bordeaux. Identifying true greatness in a young red Bordeaux is not always self- evident except for those who have tasted a large number of vintages, great and small, at all stages from barrel to bottle. That said, even “experts” may come to differing judgments after tasting a new vintage while still in the cradle, or soon after bottling. Academics at the University of Bordeaux have established criteria which determine how closely a particular growing season is correlated with the finest red wine vintages. The conditions start with a rapid, homogenous flowering and fruit set in warm, dry weather. Next, the vines should experience a degree of stress during a dry, hot July. Then, complete maturation of the various Bordeaux varieties is critical, and this can only be achieved if rainfall is relatively low and heat is short of excessive in August and September. The ultimate requirement is for moderately hot weather with negligible rain at harvest, allowing for optimum final ripening of each parcel (Geny, 2017). 2016 met the conditions of an outstanding red-wine season nearly perfectly, as did 2015, yet there are clues to explain the divergent profiles of these fraternal twins. The climatic markers are set out in the chart below (Fig. 1). The season began inauspiciously with three months of rain, more than double the 30-year average. Temperatures were generally cool through May and vegetative growth was slowed despite an early bud break. Flowering took place under good conditions and by mid-June the unsettled weather gave way to an exceptionally rain-free summer. July also brought a noteworthy boost in sun hours which lasted through October. August in particular was hot, sun-filled and parched, leading to stress in some locales. The lack of rain – a total of 100 mm – in the last four months is a distinguishing feature of the 2016 season. Compare this to 209 mm in 2015 for the same period, itself a below-average level except for August, which saw rainfall which left a mark on some ‘15s. Figure 1. Climatic parameters of 2016 compared to the averages from 1991 to 2010. Red circles and English text added by author. Source: Geny, L & Marchal, A (2017), Le millésime 2016 à Bordeaux, Institut des Sciences de la Vigne et du Vin de l’Université de Bordeaux. The back-to-back success of 2015/2016 is the most recent instance of overachieving twinned vintages. The 2009/2010 pair is certainly another – as are 1989/1990 and 1928/1929 – and it might be argued that these more recent years share a similar relationship, but arguably on a higher plane. 2009, like 2015, is rich in fruit and more immediately forthcoming; but ’09 is more powerful, flamboyant and tannic. 2010, the ostensible counterpart of 2016, is a paradigm of classical proportions marrying astonishing concentration with an imposing structure. The top 2010s are destined for decades of aging potential. 2016, though, is approachable early – and is closer to 2015 in this respect – but appears to possess the balance and backbone to age well. Still, to this taster both 2015 and 2016 are highly accessible at an early stage of life – and more precocious than 2010, 2009 or 2005 at the same point. There is a velvety feel to the 2016 reds while in 2015 many possess a tender fruitiness. These qualities may explain the euphoria both the ‘15s and ‘16s have generated in the press, evidenced by simply astounding ratings. Scores of 95 plus in both vintages send the message that these wines are among the greatest of all times. Will this latest duet of vintages live up to their initial billing? The observation of David Peppercorn MW (in his book entitled “Bordeaux”) with respect to the admired couplet of the 1920s seems to fit here. He writes that some commentators “were over- optimistic about the 1928s” but “broadly right about the 1929s as wines too pretty and ethereal to make old bones.” Might this apply to 2016 and 2015, respectively? As we consider the most remarkable vintages of the recent past, we need to speak of 2000 and 2005. 2000 was the starting point of a new century and millennium as well as a golden age of ripe, well-endowed vintages. Seductively mouth-coating and supple – and more voluptuous than 2015 – the 2000s could not be resisted from the very beginning. Many 2000s have no doubt been drunk. 2005 is a stellar vintage likely to impress far into the future. 2005 is dense and powerfully structured – a rival to both 2009 and 2010. Aside from the virtues of the wines themselves, there is the value proposition: the breathtaking prices of 2015 and 2016 should redirect attention to this earlier quartet on the secondary market. It might provide further context to consider the raw data for these vintages as well as other “greats” going back to 1982 in terms of grape sugar and total acidity near harvest (Fig. 2). The four cells shaded pale gray are the highest figures in each column. The sugar levels of 2015 are extraordinary, even alongside other years of excellent fruit ripeness, and this is reflected in the warm, sweet (alcoholic) profile of the 2015 reds. The ripeness levels of the earlier standouts – 1982, 1989 and 1990 – are much lower than the younger vintages. 1982 was derided by many in the day as a flabby New World vintage, but in reality the sugars are among the lowest of all the years listed here while the acidities are comparatively high. 2014 is perhaps the odd man out and serves as an interesting foil. 2014 is a far riper, more complete hybrid of 1988, with the higher acidities of that earlier period and the elevated sugars of today. Figure 2. 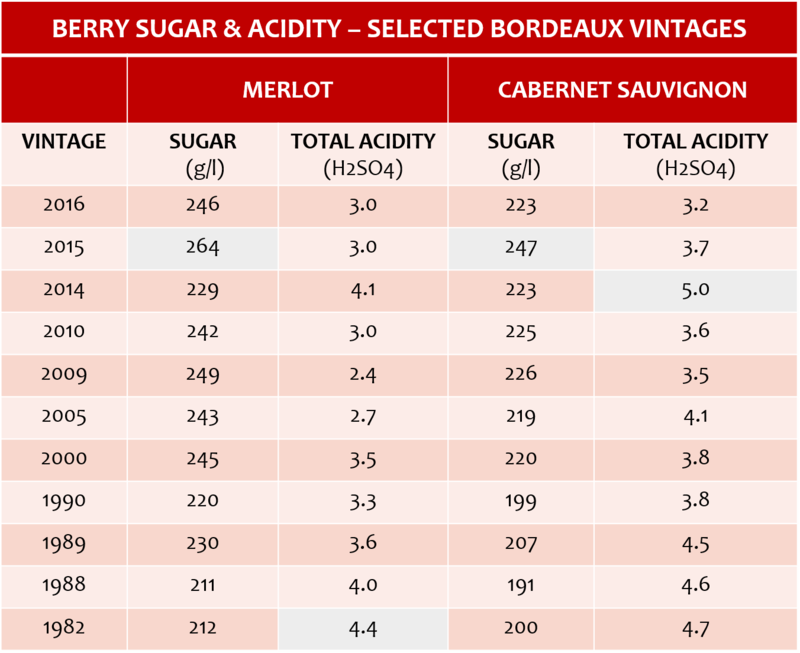 Berry sugar and total acidity of selected Bordeaux vintages. Cells shaded gray are the highest figures in those four columns. Compiled by author from vintage reports from the University of Bordeaux cited under references. How do vintages post-2000 stack up against each other? In her column in the Financial Times, Jancis Robinson MW reports on the annual Southwold-on-Thames tasting focusing on 2015 Bordeaux (Robinson, 2019). A group of U.K. professionals tasted more than 250 examples, blind insofar as the identities of the individual properties were concerned. Robinson exclaims over the “exceptional” white wines, but remarks that “the reds are probably less so and not destined from the long-term.” Her view based on tasting a range of 2016s in late 2018 is that “2016 is a better, brighter and more intense vintage than 2015, certainly for reds.” Even more telling is the judgment of the attendees when asked to rank the top years of this century: 2015 came in fifth place after 2010, 2009, 2005, and 2000 (they were not asked to comment on 2016). The top five were followed by 2011 and 2014, a year whose stock is set to rise as it matures in bottle (see an earlier essay on WineAuctionPrices.com, “2014 & 2015 Bordeaux: A Surprising Comparison”). 2001 was not cited but deserves an honorable mention, or better, especially on the Right Bank. This leaves us wondering where 2016 ranks in this century; in this author’s opinion, certainly ahead of 2015. The future will determine if ’16 rises to the level of 2005, 2009 and 2010 or, for that matter, earlier fabled vintages. What are the common denominators among great red Bordeaux vintages? They all seem to enjoy ample sunshine, more elevated but not extreme temperatures, and above all less precipitation during the season. One intriguing analysis looks at the water balance rather than heat, showing that vintage quality correlates with the availability of water to the vine (Fig. 3). With only a few exceptions – 1959 and 1982, for example – the most highly rated Bordeaux years experience growing seasons with a significant water deficit – like 2016 – whereas weak years and the outright disasters of decades past were the product of wet conditions. Figure 3. 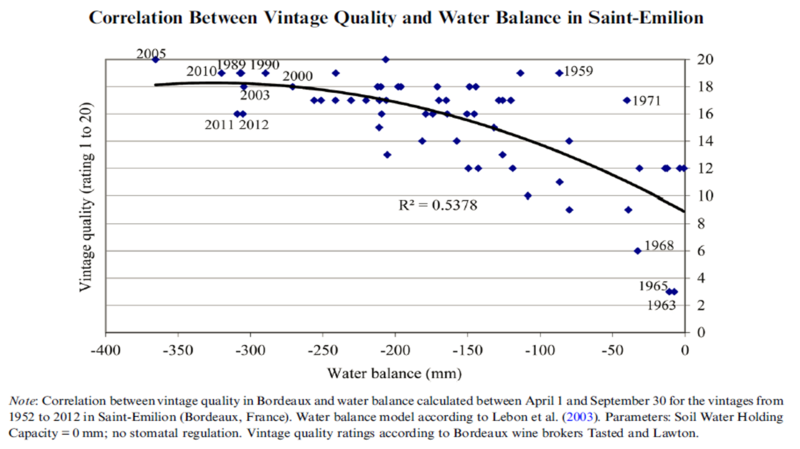 Correlation between vintage quality and water balance in Saint-Emilion. Source: Van Leeuwen, C. and Darriet, P., 2016. In this discussion of vintage comparisons, other acknowledged classics should be mentioned. 1961 remains a monumental year whose yields were decimated by coulure (infertile flowers). Temperatures were high in August and September. Rainfall was the lowest of any of the great years, merely two-thirds of 2016’s low 316 mm (April to September). 1959 was also a small harvest of rich, large-scaled reds. According to Clive Coates MW, it was “the last vintage made by old-fashioned, pre-scientific methods” without temperature control (Coates, 1995). 1947 and 1949 – both particularly hot and dry – deserve a tip of the hat. Then there is the legendary 1945, another minuscule harvest owing to a devastating May frost. By the way, both 2015 and 2016 were bountiful crops compared to earlier norms. By many measures, contemporary vintages seem to be a world apart from those of the ‘40s, ‘50s and ‘60s. While it may be a popular game among wine lovers to find look-alike vintages, every year in Bordeaux has its own personality and is never identical to any other. Broadbent, M (1980), The Great Vintage Wine Book, Mitchell Beazley Publishers Limited and Alfred A. Knopf Incorporated, New York. Coates, C. (1995), Grands Vins – The Finest Châteaux of Bordeaux and Their Wines, University of California Press, Berkeley and Los Angeles, California. Geny, L et Marchal, A, Le millésime 2016 à Bordeaux, Institut des Sciences de la Vigne et du Vin de l’Université de Bordeaux, Unité de Recherche Oenologie. Geny, L et Dubourdieu, D, Le millésime 2015 à Bordeaux, Institut des Sciences de la Vigne et du Vin de l’Université de Bordeaux, Unité de Recherche Oenologie. Geny, L et Dubourdieu, D, Le millésime 2014 à Bordeaux, Institut des Sciences de la Vigne et du Vin de l’Université de Bordeaux, Unité de Recherche Oenologie. Geny, L, Doneche, B and Dubourdieu, D, The 2010 Vintage in Bordeaux: another very great year for both red and white wines, Faculty of Oenology, Bordeaux Segalen University, Bordeaux Institute of Vineyard and Wine Sciences. Geny, L, Doneche, B and Dubourdieu, D, The 2009 Vintage in Bordeaux, Faculty of Oenology, Bordeaux Segalen University, Bordeaux Institute of Vineyard and Wine Sciences. Peppercorn, D (1982), Bordeaux, Faber and Faber Limited, London. Ribéreau-Gayon, P and Guimberteau, G, Les caracterisques du millésime 1990, Station Agronomique et Oenologique de Bordeaux, Université de Bordeaux II. Ribéreau-Gayon, P and Guimberteau, G, Les caracterisques du millésime 1988, Station Agronomique et Oenologique de Bordeaux, Université de Bordeaux II. Robinson, J (9 Feb/10 Feb 2019), Rating the 2015 Bordeaux, Life & Arts, FT Weekend, Financial Times. Van Leeuwen, C and Darriet, P (2016), The Impact of Climate Change on Viticulture and Wine Quality, Journal of Wine Economics, Volume 11, Number 1, pp 150–167 doi:10.1017/jwe.2015.21.